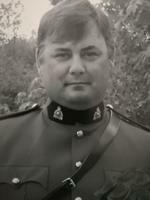 " Dan was one of the most thoughtful RCMP Supervisors I have had the pleaure to w"
It is with profound sadness that we announce the passing of a wonderful husband, father and grandpa-to-be at the age of 56 at the Ottawa Civic Hospital, surrounded by his family.Predeceased by his parents, Roland & Rodena and his brother Micheal. Dan is survived by his loved & loving wife Janet (Carroll), his cherished sons, Vincent (Joannie), Patrick (Stephanie) & Ryan; his brothers, Gilbert (Elizabeth), Terry (Francis), in-laws William (Bill) and Nancy Carroll & brother-in-law of Joanna (Marty) Jones. He will be remembered by Annette Rudman, mother of his sons.He will be dearly missed by his close friends from childhood, especially Perry Mason and the entire Mason family, his nieces & nephews Michelle, Adam, Ian, Texan, Brick & Aria & his RCMP family.Dan served proudly as a member of the RCMP for 28 years. His career took him to many places across Canada, including Iqaluit where he met Janet. He enjoyed travelling (especially to warm climates), golf, his Montreal Canadians (Go Leafs Go! ), his sidekick Honey (Little One) and was very, very excited about becoming a grandpa.Family & Friends are invited to visit at Blair & Sons Funeral Home on Saturday September 8th, 2018 from 11:00 am to 1:00 pm, followed by a service in the chapel. Reception to immediately follow at Otter Lake Park, 2853 Hwy 15. In lieu of flowers, donations to the Terry Fox Foundation, Qikiqtani General Hospital, Iqaluit or the Ottawa Civic Hospital would be appreciated. Your watch has ended, Rest in Peace.